What is the best way to invest in equity? If you ask this question to any market expert you will get a single line answer - long-term investment. There is no doubt that long-term investment is the best route to exploit the maximum growth of a business. But it's a process which needs you to be patient, something most of the people have great difficulty with. Without beating around the bush, let's take the question head-on--What are the best Long Term Investment stocks to buy in India? Instead of just listing out the stocks for Long-Term Investment, we will try to take an analytical look at the stock and the corresponding sector which will give us an insight of why the growth is expected and how long will this growth last. It's the best way to build long-term stock investment strategies. India is one of the largest chemical producers and ranks at 7th position globally and 3rd in Asia. Moreover, India is the third largest agrochemical producer and contributes around 16 percent of dyestuff and dye intermediates production. Indian chemical industry covers around 70,000 commercial products. Being an export-oriented sector, rupee movements have a significant impact on the stocks from the sector. We see a promising future for the sector from macro-economical aspects as well due to an competitive edge. Here are some of the key pointers which suggest the future story of the chemical sector. 1. Rupee Depreciation- Being an export-oriented sector, rupee depreciation remains one of the vital drivers for this sector. 2. Chinese Policy Change Benefit- China is Indias close competitor in the chemical production space. However, recent Chinese policies have given a competitive edge to Indian chemical companies. On January 1, 2019, Chinas new Soil Pollution Prevention and Control Law came into effect. Under this law, the non-compliant party can be penalized up to Yuan 2mn on the principle of polluters pay. It is expected that the major impact of this law if passed, will be on companies that manufacture, processes and trade in chemicals. The law imposes civil, administrative and even criminal liabilities for violations. This law will lead companies to spend more on legal and technical counseling as any non-compliance can attract penalty up to Yuan 2mn and executives may face administrative detention. Owing to this, expenses for the Chinese companies would go on the higher side which in turn get reflected into the prices of their products sooner or later. The phenomena is expected to aid companies from Indian chemical sector and write a phenomenal story for it. 3. Lower Employee Cost- India is known for its lower labour cost and makes it cost-efficient for the companies. The lower labour cost compared to China is the key driver for the chemical businesses as it makes them more attractive on price points as well as aid them for bottom-line growth. 4. Competitive Edge In Benzene Chain- India benefited in Benzene chain. Benzene is derived from crude oil (during the refining process) and India has a surplus refining capacity (vis--vis the domestic demand). Therefore, India is also surplus in benzene. In fact, benzene (HS code: 290220) is one of the highest exported organic chemicals from India. On the other hand, for China, benzene is one of the highest imported products. China has been an importer for benzene for last 5 years. This would substantiate our argument that Indian organic (like Benzene) intermediate manufactures were globally competitive even before the recent environmental issues in China. We can, therefore, conclude that China does not have a strategic advantage in benzene and its derivatives. Thus, Indian companies in the benzene chain are likely to be less impacted if Chinese production restarts. Aarti Industries (Aarti) is a leading manufacturer of Specialty and Pharmaceuticals chemicals with expertise in benzene-based products. It is one of the most unique global entities that is both forward and backward-integrated in its range of chemicals and across various value chains. Around 45% of the revenue comes through exports. Aarti is present in the value-chain that makes it easy for them to pass on any raw material price increase. Aarti is going beyond benzene chemistry and started operations of Nitrotoluene facility at Jhagadia which reached utilization of 40% by the end of FY18. Peak utilization is expected to reach by FY22 and estimated revenue visibility is of c. INR 3.5bn-4bn per annum. Aarti plans to introduce toluene and ethylene-based chemicals for end-use applications of agrochemicals, engineering polymers, pigments, and additives. It also earned a multi-year contract with global chemical measures. The supply contract is worth Rs 900 crore, spread over 10 years, starting Q4 FY21. To implement this deal, Aarti Industries has to do an upfront capex of $15 million (Rs 108 crore) for setting up a dedicated plant in Gujarat. This multi-year foray adds to the companys product portfolio and supply contract and implies average annual revenue accretion of Rs 90 crore per year (around 2.5 percent of FY18 sales). Revenue grew at 12% five-year CAGR and PAT grew at 19% CAGR. ROE and ROCE stood at 23% and 17%. Consumer goods sector is one of the biggest sectors in the Indian economy. The sector has seen some great times in 2017-18 and also corrected post that. We see immense potential in the sector and expect it to be a great story in the upcoming years. The sector consists of some of the great bluechips and also undervalued stocks. Here some of the pointers and the stock which can be a best long term bet for you. 1. RBI rate cut: Rate cut usually acts as a sentiment booster and aid companies that have to service large debts. A cut by RBI injects liquidity in the economy. Loans with a low rate lead to an increase in buying interests in the consumer-driven economy which will help India Inc. to deliver strong earnings growth. 2. Indian Consumer Electronics market stated to grow @CAGR of 17% over FY16-21. Dixon Technologies has diversified product portfolio (consumer electronics, lighting products, mobile phones, home appliances, and reverse logistics) with diverse top tier customer base (Panasonic, Phillips, Haier, Gionee, Intex, Surya Roshni, Reliance Retail, Mitashi, etc.). Indias cable manufacturing industry sizes around Rs.40,000 crores. Moreover, the specialized cable industry roughly sizes around Rs.10,000 Crore. The industry has witnessed a long journey in the past decade and transformed from a tiny industry to a large one. The sector seems to be promising and is expected to move ahead at 20% CAGR. Lets shed some light on the key factors that can drive this sector to form a long-term growth story. 1. Rising Demand Environment: The rising demand for the power, light, communication has kept demand for cable high. This trend is expected to continue with the shift of demand from unorganized to organized sector. Along with this, the demand for efficient, reliable data communication as well as energy would bode well for the sector. 2. Pacing Up In EV and Power Infrastructure: Pacing up of the power infrastructure, as well as EV, would drive the demand for the cable sector. 3. Raw material Prices: Copper is the raw material for the cable sector. The lowering of the prices of copper is expected to drive the operating profits of the companies from the cable sector. 4. Government schemes: Government's ambitious plans ahead for the infrastructural development are expected to aid the cable sector. The increasing urbanization is also increasing the demand for the electrification which is also positive for the cable sector. Moreover, the prime focus on railway development and smart cities is expected to aid the demand for the cable sector in the upcoming years. 5. 5G and fiber-optic network expansion: Going ahead the 5g and fiber-optic network expansion both these are the key factors for boosting the Indian cable sector. Indian textile sector is one of the oldest sectors of the economy. The sector has gone through the tough times in recent years post demonetization and GST transition phases. Post the recent correction the sector now seems to be at fair value and expected to produce multibaggers. Supportive policies from the government as well as rising demand environment are making the sector more promising for the upcoming period. Here are some of the key pointers which are key aspects of long-term growth. 1. Domestic Demand: The domestic demand always remained a key factor for textile. The sector has witnessed roller coaster ride in the recent past. However, the raising private sector consumption guarantees a robust future for the sector. In FY19 the strong private sector consumption is expected to lead the textile sector. 2. Raw Material: The cotton production which was impacted pink bollworm issues seems to be stabilized for the sector. Cotton crop production has increased by 11% coupled with the rising of the acreage of the cotton crop at 19% is expected to further moderate cotton prices. The softening of the cotton prices would aid the operating efficiency of the companies. 3. Make In India Boost: Government of Indias move of raising basic customs duty to 20% from 10% turns positive for the textile sector. The government has raised the customs duty for almost more than 500 textile products. The move is expected to be a boosting factor for domestic players as it will aid the indigenous production under Make In India campaign. 4. Export Policies: The rupee depreciation has played a role in export growth. With the government's progressive export policies to promote exports also helping the sector. With both, these positives textile industry is expected to see a robust growth in the exports. Paper industry in India seems underpenetrated but shows huge potential with the growing demand. There are many factors which are driving the paper industry to the upper levels like rising literacy rate, improved GDP, improved living standards etc. Let's shed some light on the key aspects of the industry which are capable of driving industry growth in the longer run. 1. Anticipated Demand Pick-Up: Anticipated up-tick in the education sector and the literacy rate is expected to drive the demand for printing and writing segment of the paper industry. Thereby, forecasted overall demand for the paper industry is expected to be at 6-7% CAGR in FY19. 2. Benefit From China Ban on Waste paper Import: The 40% rise in paper prices in the last few months due to capacity shutdown in China is a key positive for Indian players. The ban on import of waste paper by the Chinese government aiding the packaging paper prices which unlikely benefited to Indian paper industry since August 2017 and also expected to aid further. 3. E-Commerce: Robust growth in E-commerce is driving the demand of the packaging paper. The packaging paper and board segment form a huge part of the paper industry and favourable demand scenario is a key positive in the longer run. 4. Changing Lifestyle With Urbanisation: The packaging paper segment also serves the need of industries such as food & beverage, FMCG, Pharmaceutical, etc. The growing urbanization and improving living standards raises the requirement of quality packaging of products. These products are marketed through organized retail channels as well as E-commerce so packaging paper segment is also expected to benefit from this. Every year there are certain sectors which play a key role in moving the market. In the year 2018, we saw sectors like Automobile and Auto Ancillaries, Infrastructure and Consumer Products taking the lead. The major stocks in these sectors like Tata Motors, Power Grid, ITC, HUL, Marico, Britannia etc were some of the performing stocks of 2018. In the same way, there are going to be stocks and sectors which will do well in 2019. We at Niveza, however, don't go by the yearly stock trends but like to pick stocks which can be held with a Long Term Investment view. In keeping with this theory, if you look at last year's stocks recommendations from Automobile and Auto Ancillaries, Infrastructure you would realize that these stocks have not yet run out of steam. After the budget 2018 correction, some of these stocks were still available at attractive prices. Similarly, for 2019, we have to give you stocks ideas which not ride the current trend but keep marching ahead even after the trend dies down. Every stock in its lifespan goes through several ups and downs. In between, there are so many things which propel its movement e.g. quarterly results, a sudden slump or rise in a certain sector, change in the management, etc. When you buy stocks with the long-term perspective, you have to take into account all these roadblocks and also the fundamentals of the company which have to be solid enough to sustain the bumps of the stock market. In short, finding long term shares is a Herculean task. One needs to have a thorough understanding of the equity market and good analytical skills. It can't be accomplished by merely looking up long term stock picks in India. Hence, if you want to invest in stocks but don't have time to research, it's a good idea to subscribe to a stock advisory firm. If you are an investor, you must have heard a lot about long-term investment while chalking out your investment plan. It's safe and secure and saves you the trouble of day-to-day market hassles, things like that? It's all true, but there are also few untold yet important benefits of going long which you might not have heard before. Let alone the 'risk' factor, here's an example to illustrate how short-term perspective can backfire. Imagine you have a capital of Rs. 1 Lakh and you invest it in stocks. Six months down the line you get around 25% upside on your invested capital taking the value of your capital to 1 lakh 25 thousand. Getting 25% profit in 6 months is a good deal, I wouldn't blame you if you take that deal. Most of the investors would do the same. But considering the fact that you have bought good stocks, booking profits early may not be a smart thing to do. Those stocks go-ahead to become multibaggers and you miss out on 2 things - more profit and regular dividends. The Union Budget 2018 brought a sad news of the departure of long-term capital gains. Going forward, all the gains in equity above Rs.1 Lakh will invite tax of 10%. For example, if you have invested Rs.5 Lakh and have earned a profit of Rs.1.5 lakh, in this scenario, Rs.50,000 would be taxed at 10%. Before this law came into existence, the returns on the stocks which were held for more than 1 year were absolutely tax-free. This tax exemption was given by the government to encourage people to invest in equity and equity-linked instruments. After this development, the equity gains will take a little hit, but despite added tax burden, the sheen of equity investment is still intact. It still remains the only investment medium which has the potential to give uncapped returns. The well-planned investment in stocks has better chances of fetching handsome returns than any other investment medium. 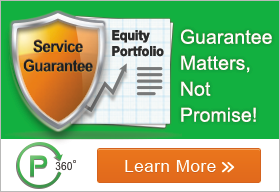 There are few investors who give a serious thought to equity brokerage they pay. They think it's a nominal amount that brokers deduct before delivering the stocks. Brokerage in India is extremely high, to add to it, there are plenty of taxes and cesses which are levied on every trade (buy & sell). Naturally, short-term investors and day traders have to pay more brokerage as they are constantly engaged in the buying-selling process. On the other hand, those who go long, and refrain from constant buying and selling of stocks, save a lot on brokerage, cess and taxes. In simple terms, compound interest means the interest you get on the interest. So how is it relevant to stock investment? If you are investing on a long-term basis, you will get dividends on your stock holdings. The dividend is a kind of a bonus you get on your stocks. We are assuming here that you have invested in stocks which have decent dividend yield rate. So as the dividend is a bonus income, you get an opportunity to roll it over into other promising stocks which will bring you more income. In a way, you are earning income from the income which is a form of compounding. So you are experiencing the power of compounding. Isn't that a great deal? It is true that you can apply the same theory to your short-term investment. Where you buy one stock and sell it once it reaches target then invest the same capital (along with profits) in new stock. Yes, that is also a version of compounding. But here's how the long term has an edge over short-term. In long-term investment, you get the dividend which is a bonus income. Hence, you don't have to sell your principal investment. Unlike short-term where you get the profit at expense of selling good stock, in long-term, you get to eat your cake and you can have it too. We started this article with the events of the day of a day trader. As perfect pay off, we should also give a rundown of the events of the long-term investor. Certainly, it will not be as eventful as the day trader's but they enjoy the biggest gift the life has to offer - peace and a sense of satisfaction. Ironically, the objective of the short-term, long-term and intraday investors is one and the same--wealth creation. But should we be obsessed with money? Is it worth putting your hard-earned money on the line, and living in perpetual anxiety while the market goes through its quintessential ups and downs? Certainly not! The best part of being a long-term investor is that you get a peaceful sleep in the night. Unlike day traders, who constantly live in the anxiety of buying and selling, long-termers just park their money in good stocks and devote their time to pursuing good things in life. The immediate success of day traders may look tantalising, but it comes at an expense of heavy risk bearing and emotional upheaval. Is it worth losing your sleep for some petty gains? Not at all. Go long, dear investors! A marriage, a relationship between husband and wife, is a perfect analogy for long-term investing. First and foremost, like in marriage in long-term investment, you think long and you are convinced about the prospects of your partner. Like in marriage, in long-term investment, there are ups and downs, moments of happiness and sadness. And lastly, the profound facet of both these institutions is a happy life. Like a successful marriage, a successful long-term investment plays a crucial role in providing you with a happy and satisfied life.